Simply engage your Google Assistant with the press of a button on the inline remote control to fully control your music or receive notifications without glancing at your phone. 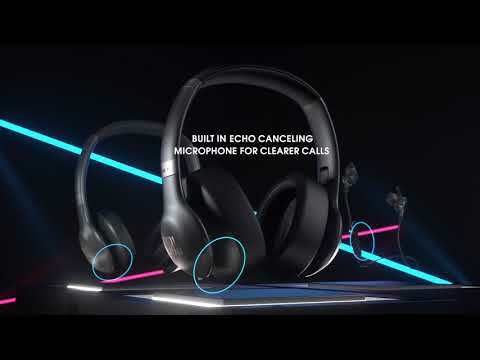 JBL Everest™ 110GA in-ear wireless headphone comes with Legendary JBL Pro Audio sound that delivers a dynamic acoustic performance, for up to 8 hours on a single charge, with a 2-hour quick recharge. Now optimized for the Google Assistant, you can take full control of your music experience using your voice and receive notifications without glancing at your phone. Simply get help from your Google Assistant with the press of a button on the inline remote control. The ergonomic design understands every contour of your ear, and fits in snugly for unmatched comfort and hours of listening pleasure. Enjoy crystal clear, hands-free calls using the built-in microphone with echo cancellation. Dare to listen. EVEREST 110GA is rated 3.0 out of 5 by 7. Rated 5 out of 5 by Migs from Price point Not bad for the price. If you are looking for something not too expensive but good quality. Its the way to go. Rated 4 out of 5 by dmj7386 from Great features I bought three pairs for my kids. Good value, sound good. Rated 2 out of 5 by bustipandi from Do not last Had to replace this earphones 3 times because the volume would lower by itself and then they stopped charging, in other words, died! Sound is good but these earphones are NOT made for sports, definitely not sweat resistant! What IPX are these? I am looking for a running pair and wonder if these are rainproof or at the least, sweatproof. What cable is the charging cable please? If it's not USB type C then this is an instant no go. Hi!&nbsp;Unfortunately, all of our wireless headphone&nbsp;comes with the standard micro USB port for charging. Do they have ambient noise technology? Where you can specify hearing the outside world or voice? The JBL 110GA features echo cancellation so you can enjoy crystal clear, hands-free calls using the built-in microphone without any echos. How do I pair the headphones to a second device? Hi! You can simply press the Bluetooth button (center button) on the earphone for about 3 seconds to pair the 1st device to the JBL Everest 110GA. Afterwards, repeat the same process for the 2nd device. Then you can simply switch between the 2 devices. Please note that only a maximum of 2 devices can be connected. what botton do I press to turn on the bluetooth? When it is red does that mean it wont connect to the phone? You need to press on the middle button of the Everest 110GA for 3 seconds to put the unit in pairing mode. The red light indicates that it's currently charging. You'll need to take it out of charging in order for you to get it paired. Could you tell me please what difference with EVEREST 110? Thanks for reaching out, the only difference is the built in Google Assistant on the Everest 110GA. But the Everest 110 and the Everest 110GA has the same built and quality. If you have questions or concerns, please submit a case request at https://www.jbl.com/support-contact.html and the Customer Service Team will be more than happy to assist you. The ringer and vibration are both set to off on my phone, yet it still rings and vibrates when these headphones are connected. Why is this and how do I shut it off?